Frederick Wiseman has often referred to his films as being “novelistic, not journalistic.” This is an important distinction, given their curious, often revelatory nature. His films shine a light on specific people in specific places, and the systems that weave the social fabric of those places. Whether he’s laying bare bureaucratic indifference and incompetence, as in films like Titicut Follies and Welfare, or just simply immersing himself within the civic ebb and flow of communities and institutions, what unites all of the accomplished octogenarian’s films over his 50-year career is an earnest, tender desire to reveal the humanity behind every social apparatus. In his new film Monrovia, Indiana, Wiseman once again turns his inquisitive eye toward the daily workings of municipal life. Though unlike the diverse and densely populated Queens neighborhood of In Jackson Heights, or the urbane intellectualism on display in Ex Libris: The New York Public Library, to name his two most recent films, Monrovia, Indiana plants itself within the rural American heartland, specifically the languid Midwestern town of the title, whose population sits at a whopping 1,063. Despite the political undertones of filming in small town America at a time when the country is deeply divided, Monrovia, Indiana eschews any talk of politics. This makes the film all the more resonant, for it instead paints a sprawling, sympathetic portrait of middle- and working-class folks—who were likely Trump supporters—simply trying to survive day to day. Wiseman’s film humbles the rest of us to the ways in which we rely on, yet take for granted, the basic necessities and resources provided by rural America. Wiseman films the quotidian with impressionistic grace, rhythmically returning to exterior shots that luxuriate in the natural, textured countryside. Here, luscious images—the grass is vibrantly green; the sky a rich blue, with clouds that hang like fat marshmallows—are juxtaposed with the residents’ granular, unglamorous daily grind. The film’s lingering elegiac power extends to the last sequence: a funeral and burial observed from a quiet distance. Even after the coffin is in the ground, Wiseman remains fixated on the cemetery’s landscape; the moment’s elusive, existential poeticism brought me to tears. Monrovia, Indiana is a ruminative, compassionate look at life and mortality: no matter where we come from, we all eventually end up in the same place, surrounded by nature’s tranquil beauty. Until then, tomorrow brings another day. I had the chance to sit down with Wiseman leading up to the film’s post–New York Film Festival U.S. release, and our conversation ranged from his days playing hooky at Yale Law School, to the valuable lessons he’s still learning as an 88-year-old auteur. Reverse Shot: Monrovia, Indiana seems to follow in the spirit of In Jackson Heights and Ex Libris: The New York Public Library; two of your other recent, civic-oriented films. Is it fair then to say that you’ve deviated from your earlier, grittier work exposing bureaucratic malfeasance or indifference in films like Titicut Follies? The community denizens in Monrovia are nothing if not invested in their community. Would you agree that your films in a way have become less confrontational over time? Frederick Wiseman: Well, you’d have to be an absolute idiot to make a film about Bridgewater as it was in 1966 and not show how horrible it is, but I don’t think I make exposé movies. I respect those who make them, but I’m more interested in treating a subject to reflect its complexity. If some people want to think of my movies as exposés that’s fine, but it’s too limiting to set out to make them. Lots of people make good films that way, but it’s just not my cup of tea. RS: Perhaps your approach hasn’t changed, but what about your subject matter? Do you think the issues you tackle have become less outwardly confrontational or provocative over the years? FW: Years ago I read a review of one of the ballet movies I made, where the critic wrote that it wasn’t “Wiseman-esque.” I think the person that said that didn’t really understand what I was doing, because I try to make as many movies as I can on as wide a variety of subjects as I can. I think that person felt that my movies were exposé movies, and that what I was really doing was showing how badly poor people were treated by the state. Granted, you see some of that in my movies, but that’s not the point of them. I’m trying to record as many aspects of human behavior as I can. RS: You’ve previously said your films are “novelistic, not journalistic.” Indeed, your films exhibit an inquisitive eye that seems to stem from a deep affection for humanity. Do you see your films as being political? FW: Well, it depends on what you mean by political. I mean, I think Trump made Ex Libris a political film. I think I finished the mix and color-grading two days after Trump was elected. Because the library represents all values that Trump doesn’t understand and opposes, it became a political film. Libraries are interested in historical records, in learning and reading and helping people. And Trump isn’t interested in doing any of that, and instead tries to subvert those values. RS: Do you think your background in law fostered this passion for probing the dynamic between individuals and the systems they are a part of? FW: Well, when I was in law school I didn’t go to class, and instead I read novels for three years because I didn’t like it [chuckles]. I knew how to write the exams so I got through, but I hated law school. When I went to college I was taught how to read carefully, so that education helps me a lot in making movies because I basically have to think I understand what’s going on. RS: Is the recent transition to the more positive or inspiring aspects of society, civic engagement, and human behavior a way for you to eschew cynicism? FW: When I made Law and Order in 1968, the generally accepted view was that police were all pigs. Well, when you ride around in a police car for about 30 seconds, you realize the piggery is in no way restricted to police, because you see that what people do to each other makes police necessary. I don’t say this to condone police brutality when it happens, but instead to put it in a continuum with human brutality. National Gallery (2014) is an extremely harsh film that deals with religious persecution, violence, war, plague, murder, and pedophilia, because that’s what the paintings are about. So my point is that this transition you mentioned was never a conscious or deliberate choice. RS: Why Monrovia? There are so many small towns in the American heartland, so why choose that one? FW: It was just by chance. I was talking to a friend who teaches law in Boston, and I said I wanted to do a film on a small town in the Midwest, so she put me in touch with a friend of hers who teaches law at the University of Indiana law school. It was by chance that I was scheduled to show some movies in Bloomington two weeks later at the University of Indiana, so I called up that friend in advance. After telling him about my next project idea, he introduced me to his cousin Maggie, who happened to be the town undertaker and knew everybody. I had spent two hours in Monrovia prior to shooting, but in the five or six weeks from the time I met Maggie until the time I came out, she had contacted some of the principal people in the town whose help I needed; the school board, the town council, some restaurant owners, and the owner of a supermarket. So when I called these people, the way had already been paved from my earlier request. Because Maggie had vouched for me, the townspeople were ready to accept me. RS: One thread connecting your films is that they share a democratized gaze. Is there a reason you never focus on a single person, but rather a tapestry of subjects? FW: Some people make very good films doing that, but I like to cast a wider net. One of the things I’m interested in when I make my movies is to show as wide a variety of human behavior as I can. I’m not saying that the way I make films is the right way; it’s just the way that interests me. RS: Have the Monrovia locals seen the film yet? What was their reaction? FW: I had about three screenings at the end of August. That night I took over a multiplex, and about six hundred people came out, and there was a positive reception. RS: Your documentaries seem to be anchored around a running theme of change vs. stasis. In In Jackson Heights, that change was brought on by gentrification; in Ex Libris it was digitalization. But with Monrovia, stasis rather than change seemed to be the underlying theme, almost to the point where the film seemed to invite reflection on the decay of the American heartland. FW: I’m conscious of the issues you’re describing, but as you may well know by now, I avoid characterization. RS: I fell into the trap again! I’m sure you can understand that as a writer, characterization is unavoidable. FW: Of course, it’s just that I’m not doing it [chuckles]. 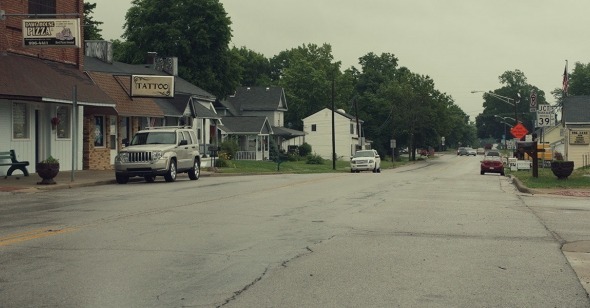 RS: Perhaps more so than your other films, Monrovia, Indiana struck me as being particularly existential, as if there’s a sense of dread, or a fear of mortality, hanging like a cloud over the working class townspeople. Is your interest in the daily grind of life consciously informed by this existential tension? FW: Oh yes. In a sense, that’s what a lot of movies are about. The theme or subject that cuts across most of my movies is ordinary experience. RS: Would you say your sensibilities or ideologies have changed over the course of your career? FW: Well, I’d like to think I’ve learned something over the years, and that whatever I’ve learned is a necessity for my process. I know more about how to make a movie now than I did when I started, and I think I’ve learned most about how to make a movie because I’ve edited them myself. When you’re editing and you realize you don’t have a shot that you need, you remember to get that shot next time you’re filming. RS: You’ve said in the past that prior to starting a new project, you don’t have a story in mind, and that the story develops in the editing room. Why do you choose to structure your films this way, rather than building out from a narrative idea? FW: I don’t build out from an idea because I feel that’s too restricting. In a sense, the final film is what I’ve learned. The final film has to be a dramatic narrative, which among other things expresses what I’ve learned about the place. It isn’t until the last stages of the editing process that the story is even found. The themes emerge as a consequence of the sequences I choose to include and the order in which I place them. The order is not random, although some might think it is. A lot of structure goes into the film. Monrovia, Indiana would be a very different movie if, for example, the funeral sequence wasn’t in it, or if it was in the middle of the film. RS: Is Monrovia, Indiana is part of your “institutional series”? FW: Yes, because I have such an expansive view of what constitutes an institution, though I don’t know that any sociologist would agree. Even a small town can be considered an institution in the general sense of the word. But the whole institutional label is mainly an excuse to have a look at human behavior within the confines of certain limitations—whether that limitation is a building, several buildings, or a relatively small geographical area. I mean, Jackson Heights has 150,000 people compacted into an eighth of the size of Monrovia. RS: The pacing of your films is very attuned to the specific rhythms of the geographical areas you film in. FW: I try to find a rhythm that suggests the rhythm of the sequence being edited. The rhythm of feeding an animal in a zoo, for example, is different than planting soybeans. I work very hard on the rhythm of each film, which is a response to the events and the way they’re shot. RS: Do you have an editorial collaborator? FW: No way. I don’t show the movie to anyone until it’s finished. My editorial process takes a year. RS: How big is your crew when you shoot? FW: It’s two others and me. I direct and do the sound, and I work with a very good cameraman, as well as an assistant who helps us both. RS: Has there been any moment in your career where what was being filmed was too intimate or disturbing to include in the final movie? FW: Once, in Hospital. There was a New York City subway worker who was brought in because he touched a third rail, and all his nerve endings were destroyed. He was quite conscious and not in any pain, although the transmitted pain was still functioning. I decided not to shoot it, but in retrospect I think it was a mistake. RS: How do you choose your next project idea? FW: Whatever interests me. Sometimes the subject is selected from a running list that I have in my head, and sometimes something just comes up by chance. The most important thing is that I have to feel enthusiastic.